Tamerica's all new TCC2100E Electric Punch and Bind machine offers an all-metal durable and easy to use machine for around the office or at home. The TCC 2100E features an electric punch capable of punching 15 sheets of 20lb paper up to 12" in length as well as a binder to bind books up to 2" thick. With 21 fully disengageable dies, 4-position punching depth adjustment, and hollow ground self-sharpening dies, the Tamerica TCC-2100E offers ease of use, flexibility, and convenience without any compromise to quality. A full year manufacturer warranty helps ensure your machine is always properly functional. Fully compatible with all plastic comb binding supplies and binding covers carried by MyBinding.com, the 2100E will accomplish any task you have for it with ease. Punching length up to 12"
I was very pleased with the machine and how easily it setup and was able to start using almost immediately. So happy to have gotten the electric and did 200 booklets in short order! The prompt mailing was wonderful and being able to track the package helped me feel secure in my first order from mybinding.com. Wonderful company. Welcome to MyBinding Video. 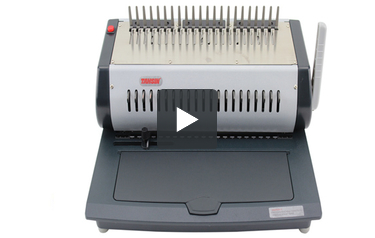 This is the TCC 2100E by Tamerica, an electric plastic comb binding machine. This all-in-one unit allows you to bind a book quick and easy. The side margin control knob helps you make sure all punches are consistent throughout your projects and the button on top makes for easy punching. The 2100E has the advantage of fully disengageable die pins. So if mis-punched or half-punched holes, you can disengage any of the dies. It also allows you to work with different size sheets of paper. With your holes centered, it's time to adjust the depth of margin. There are four different settings allowing for thicker or thinner margins depending on the size of your project. With all settings in place, let's begin with the covers. If you start face down, be sure to process the whole project through face down. The 2100E can punch up to 15 sheets of 20lb paper per punch and with a punching length of up to 12 inches. With all papers punched, assemble it together, put it in order, and get a comb. When you load the comb in the comb opener, make sure the teeth face up and the project faces down. That way it won't fall apart in use. Use the lever on the right hand side to open the comb just as far as you need, room enough to slide the project in but also enough teeth to grab the holes. And then thread your project over the teeth of the comb. Close up the comb opener, remove your book, and you're all done. That's it. That's the Tamerica TCC 2100E. For more demos, reviews and how-to's, check out MyBinding.com. The TCC-2100E can punch up to 15 sheets of paper at a time which is a respectable amount. The punching length is 12 inches so you'll be able to use oversized covers. You can control where the pages are punched because of the punching depth adjustment control. The punch is operated electronically which really helps speed up the process. This machine is compatible with combs that are 2" thick, so you'll be able to bind books containing up to 500 pages. You can also bind smaller documents if you wish. It's up to you. This device has 21 dies that can be disengaged. This allows you to punch and bind documents of varying sizes so you'll have a lot of room for creativity. This is a very well-built machine that has all metal parts, including hollow ground dies. This ensures that you'll be able to use this device for a long time. If you need a place to store your supplies, the TCC-2100E has a comb storage tray for your convenience. Having your supplies nearby will definitely help you save time as well as keep your work space organized. Unfortunately, some people might have trouble using this device because of the handle placement. So if there are a lot of left-handed people in your organization, you may want to think about purchasing a different machine. Finally, this device is 100% compatible with all the combs and covers available these days. That way you'll be able to get the supplies that are just right for your document. The Tamerica TCC-2100E is a very good comb binding machine that would be a great choice if your organization needs a binding system. It doesn't have the highest punching capacity in the world, but it's great that the device is compatible with 2" plastic combs. Disengageable dies are always a welcome feature and that alone will be the selling point for some people. But what really sets this machine apart is its construction. It's very well-made and the fact that all its parts are metal means it will last for years. Thus, the TCC-2100EE would be a great choice for companies and organizations that need a reliable comb binding machine that will stand the test of time. Is the storage tray removable? Thank you for your question. The storage tray of the Tamerica TCC2100E Electric Plastic Comb Binding Machine is incorporated into the base of the machine and is not able to be removed.